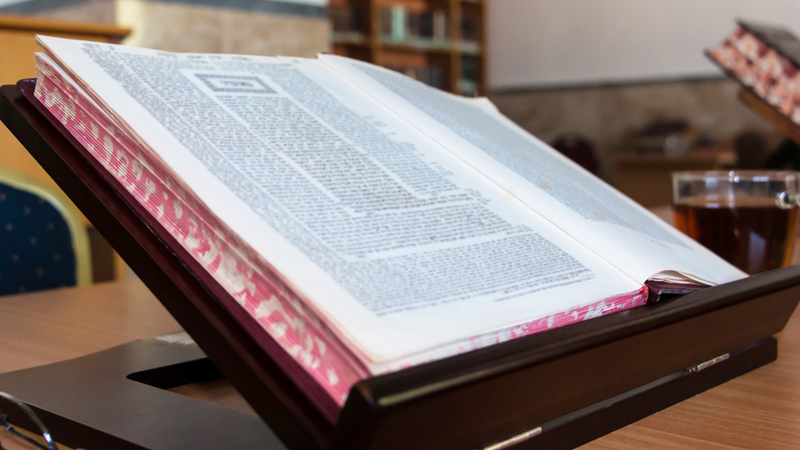 Rabbi Melvin Gruber has dedicated his life to studying and teaching the Talmud, a written compilation of Jewish oral law and tradition, and the subsequent commentaries on it. But for a time, debilitating itching, fatigue and high fevers — symptoms of bile duct obstruction — kept the rabbi from teaching. "The saddest thing is when he hasn't touched his books," his wife, Barbara, says. Rabbi Gruber turned to John Martin, M.D., a Mayo Clinic gastroenterologist, for help. Dr. Martin was able to offer him a series of specialized procedures that opened the blocked bile ducts, relieving the symptoms and allowing Rabbi Gruber to return to his work. "I feel good. I can give my classes, which I couldn't do before," Rabbi Gruber says. "I have a grandson who's going to have a bar mitzvah, and I am now able to prepare him, which makes me so happy." In 2001, Rabbi Gruber had a liver transplant. He needed the transplant due to serious liver damage from primary sclerosing cholangitis, a rare autoimmune disease. The disease involves persistent inflammation that causes scarring, hardening and narrowing of the bile ducts, which carry the digestive liquid bile from the liver to the small intestine. Twelve years after his transplant, Rabbi Gruber developed bile duct infections. Those infections led to obstruction of the bile ducts that triggered itching and fatigue. His care team in Chicago evaluated his condition using a procedure called endoscopic retrograde cholangiopancreatography, or ERCP. During the procedure, a flexible tube is passed down the throat and into the small intestine. Dye is injected through the tube into the area where the bile ducts from the liver empty into the intestine. Every year to year and a half, the rabbi had these procedures along with balloon dilations. During the dilations, a slender tube with a balloon at its tip is placed in the bile ducts. Then the balloon is inflated to open the blocked ducts. These procedures kept Rabbi Gruber's symptoms at bay for a time. In 2017, the rabbi's fatigue and itching became debilitating again, and he began experiencing high fevers. He asked his local hepatologist to refer him to Dr. Martin at Mayo Clinic. Dr. Martin previously treated Rabbi Gruber in Chicago, but he had moved to Mayo Clinic's Rochester campus. Dr. Martin performed an ERCP for the rabbi in February 2017, widening some of the blocked bile ducts with balloon dilation. After that, Rabbi Gruber returned to Mayo Clinic in April 2017 for another balloon dilation, as well as stenting. Stents are tubes placed in the bile ducts that force the ducts to remain open. Dr. Martin did the procedure in a way that was tailored to Rabbi Gruber's medical situation. "We felt such confidence in Dr. Martin. He always makes us feel at home." "ERCP is not offered in very many medical centers for patients with this particular type of liver transplant anatomy because the distance between the mouth and the reconstruction of the bile ducts created during a transplant can be two to four times the normal length," Dr. Martin says. "You need physicians who are technically capable of performing a complex ERCP using a longer scope that's not made specifically for this procedure, which can take anywhere between two and three hours." To ensure the best outcome, Rabbi Gruber and his wife traveled to Rochester from Chicago every couple of months for the procedure. Each time, they were pleased with the care the rabbi received. "The nurses are wonderful," Rabbi Gruber says. "When they roll me into the room for the procedure, they make me feel more relaxed and at ease." "We felt such confidence in Dr. Martin," Barbara says. "He always makes us feel at home." With each visit to Rochester, Rabbi Gruber was able to go longer periods of time without being homebound by extreme itching and fatigue. "Recurrent dilation and stenting have afforded him a minimally invasive way to keep his liver functioning and relieve symptoms," Dr. Martin says. "For him, it restores quality of life and functionality." Several months ago, Rabbi Gruber finally was able to resume his classes. "Being able to share my insights on the Talmud and the Torah gives me a lot of joy," he says. In December 2018, the rabbi felt well enough to teach both early morning and late-afternoon classes at the synagogue. "That was the first time in a year and a half that he could do that," Barbara says. "It was a big breakthrough." "When we go to Mayo, my personal feeling is I'm going to see a good friend." With Rabbi Gruber's life no longer limited by health concerns, the Grubers are grateful for the compassionate care he received at Mayo Clinic that's restored his ability to teach. "There are a lot of good doctors out there, but Dr. Martin really treats us like family," Barbara says. "He's shown us a level of caring that I've never seen from anyone else." "When we go to Mayo, my personal feeling is I'm going to see a good friend," Rabbi Gruber says. For Dr. Martin, being able to develop and maintain that type of relationship with a patient is crucial. "It's the human side as well as the expertise we offer at Mayo," Dr. Martin says. "People know when you care about them, rather than just caring for them, and that's what keeps people coming back." Read more about liver disease. Learn about Gastroenterology and Hepatology at Mayo Clinic. Connect with others talking about primary sclerosing cholangitis (PSC) on Mayo Clinic Connect.